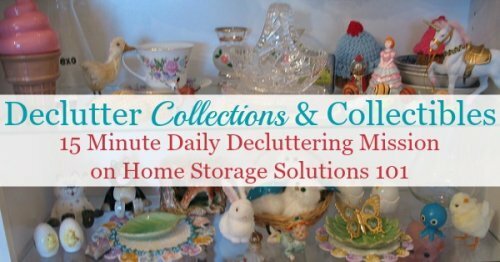 Today's mission is to declutter collections and collectibles from your home, or to at least assess whether the things you do collect are things worth it, to you, to continue to keep in your home. Whenever this mission comes up in the Declutter 365 calendar I always get someone who says something along the lines of, "I'll declutter my collectibles when they pry them out of my cold dead hands." The message is clear -- don't even go there! I'm not getting rid of anything. I get it, I really do. I have collections, which means I certainly would not and could not tell you that you can't have any for yourself. No, far from it! Instead, this mission is designed to allow you to carefully consider what you are collecting, make sure that makes sense in your life, and then keep the collectibles or collections that you enjoy and fit within the space you've got available for them, so you can get maximum enjoyment from them. So with those ideas in mind, let's get down to doing today's mission! I've intentionally tried to leave this mission broad, because collections and collectibles are very personal, and can be almost anything. You may collect stamps, coins, dolls, figurines, stuffed animals, coffee mugs, dishes or glasses, antiques, knick knacks, heirlooms, etc. Whatever it is you collect, today's the day to deal with these items. As with all the Declutter 365 missions, I encourage you to work on this for 15 minutes increments. Depending on the size of your collections, or the number of collectibles you currently have, it's understandable if it takes you quite a few 15 minute increments. But I do suggest you evaluate how you're feeling, and do any clean up necessary, at the end of each 15 minute time period. This means if you're on roll and making decisions, great, keep going when each 15 mimnute increment is up. However, if you become exhausted emotionally or mentally, from making decisions, you can stop and give yourself a break, so you feel better about the decisions you do make when you begin again later. Also, reassessing if you need to clean up after each 15 minute increment helps you keep from pulling out too much stuff at once, which keeps you from feeling overwhelmed. In addition, if you clean up as you go while decluttering then you don't fall into the trap of leaving yourself too little time at the end to actually clean up what you've pulled out, so you assure yourself that you won't leave a bigger mess behind than what you started with. I've developed a series of questions and thoughts you can ask yourself when evaluating your collections and collectibles to help you decide what should stay versus what should go. You don't have to use all the questions, just the ones that fit your situation, and also whichever ones help you come to a decision for yourself about each type of collection you own. Question: Does This Bring Me Joy And Fulfillment? Normally collections and collectibles are not items you "use" but instead items you enjoy owning, so a lot of the normal questions you ask yourself about whether something is clutter, such as when was the last time you used it, aren't particularly applicable. That's why, for these types of items, I suggest asking the question of whether the collection brings you joy and fulfillment. The idea behind your collections is that they make you happy in some way, but there are times when something that we collected in the past no longer gives us that joy or fulfillment anymore, and if that's the case that's a huge indication it's time to let that particular collection go. Question: Do you display your collection, and if so, does it make you smile? One way you can tell if your collection still brings you joy and fulfillment is to consider whether you actually display it, or not. If the collection is stored away in a box somewhere, and you don't come across it for long stretches of time, it's time for you to consider whether you actually need to keep it. Similarly, even if you have something out, or displayed, do you still walk past the collection and smile, or do you forget to even notice it most of the time? If you haven't actually stopped to admire or enjoy that collection, and instead just ignore it, it may have turned into clutter for you. Question: Are you willing to take care of your collection regularly? Anything and everything we own requires a price from us, and sometimes that price is upkeep. 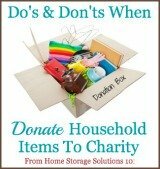 For some collections you may need to dust them, for others to work in some other way to keep them in good condition. Ask yourself, are you willing to put forth the time and effort necessary to keep your collection looking great, or in proper working order, or organized, or whatever it is that you've got to do for it? If that upkeep sounds like way too much work then it may be time to part with that collection. Personally, for me, as a person who is NOT a fan of dusting, if I notice that something is collecting dust and I don't have the motivation to get it dusted off that's a big personal red flag that the item may not bring me joy and fulfillment anymore. Question: Am I being reasonable in how much I think this collection is worth monetarily? We live in an age of stories where a Beanie Baby sold for $10,000, or someone bought a painting at a yard sale for $1.50 and it was worth $1 million. While those stories are usually true (if you see them in a reputable newspaper, not necessarily from word of mouth, like a fish story), it may overexaggerate for most of us how common this huge appreciation in collectibles is. You may have something lingering in your collection that's worth a lot of money. It's possible. But I've found, from personal experience, it's not that likely, or at least not as likely as I want to think it is for my own stuff. So if you feel like you need to hold on to a collection as "an investment," even if it doesn't bring you joy and fulfillment anymore, make sure you're actually right about how much it's worth. One of my personal favorite ways to check and see how much collectibles really cost is to go on eBay. I can look up my collectible, see how much others are asking for it, or willing to pay, and usually my imagined riches diminish with reality rather quickly. I have yet to check and find something worth as much money as I hoped it might be. The upside of this, after I give a sigh of disappointment that I'm not yet going to be a millionaire, is that I can let go of that item without guilt and having "what if" thoughts in my head. Instead I can assess, with real facts, how much the item is worth. Often that allows me to feel much better about letting it go. And, if your collectible really is worth as much as you thought or hoped, and you find that out in a more concrete way with this exercise, then you may find more joy and fulfillment by selling it, and using the cash for something else to make you happy or fulfill a real need. Question: Do you have enough space in your home to store or display your collection without everything feeling cramped? 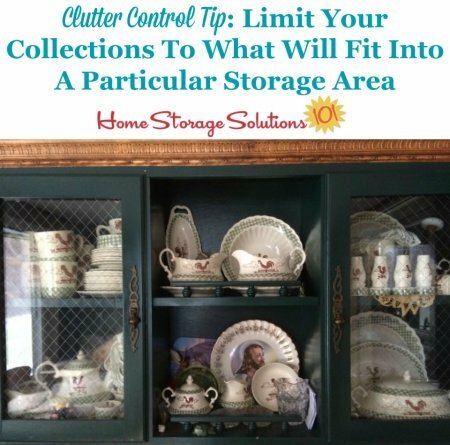 The final question you can ask yourself, when deciding what collections to keep versus get rid of, is do you have enough space in your home to store or display your collection without everything feeling cramped? This question is designed to help you identify if your collection, while still making you feel joy and fulfillment, has perhaps outgrown the size it really should be. You may enjoy a few figurines, for example, but the current size of the collection, at over 100, may be too many. 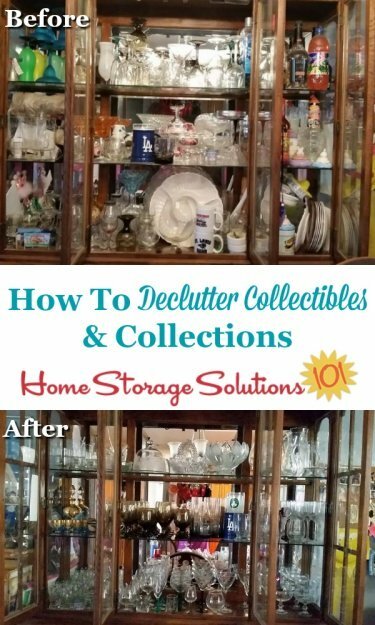 If that's the case, but you want to keep some items, check out the tips below for how to identify which items to keep and how to keep the collection at a more manageable size. Sometimes there are collectibles and collections that used to bring you joy and fullfillment, but now don't, or they otherwise fit into the categories listed above of items you're going to get rid of, but they are sentimental. If that's the case you may struggle with getting rid of these things. Collections and collectibles are often sentimental, so these feelings are normal. 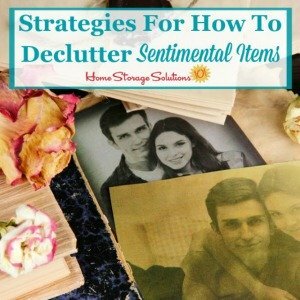 However, sentimental clutter is still clutter, so use these tips and strategies for how to decelutter sentimental items in this article, to help you decide what should be kept and what can go, and to also feel at peace with the decisions made. Part of the joy of collections is hunting for the next thing to add to it. However, with time, your collection can grow to an unmanageable size. If you identify with this problem, and you keep trying to buy more display cases, or more boxes to hold everything in, or more albums to organize things in, it might be time to consider if your collection is too big, or too much. If you can't fit one more thing into the display case, or your collection is now taking up living space in your home, I suggest you decide how much space you're going to give to your collection, and then make a hard and fast rule for yourself that you won't exceed that amount of designated space to hold it in. Only have as many of something as will fit into one box, or on one or two shelves, or into one display case, and then stop collecting. Get rid of the excess of the collection that doesn't fit, and then follow the one in, one out rule for the future. If you want something new for your collection you'll need to get rid of something you already have, so everything still fits. That's exactly what a reader, Diana, did, and she shared the photo shown above. She explained that the photo was of her antique dish collection, most of which she doesn't actually use, and so she only keeps what she can fit into the cabinets used for display. This technique is also helpful to keep you from bringing new stuff into your home, since when there is limited space you're much more discerning about what you'll add to the collection in the future. 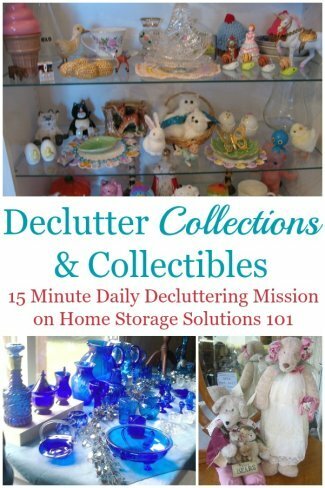 Here are some photos from readers who've done this mission already, and gone through the tough decisions about what to keep versus get rid of, when looking at their collections and collectibles. You can see from these photos how these efforts really produce great results in your home, and also I hope they'll get you motivated to tackle this task for yourself today! First, here's a set of before and after photos from a reader, Gena, who worked her china cabinets. 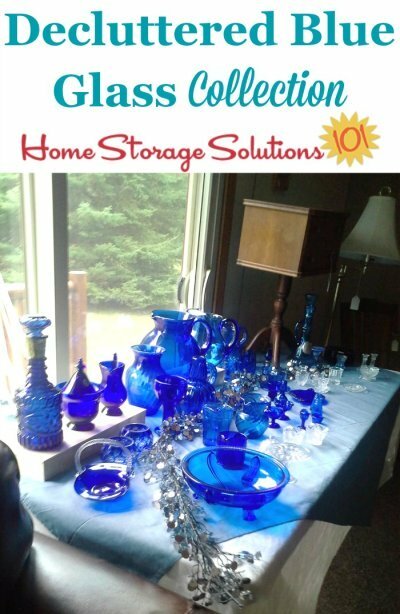 Second, here's a photo sent in by a Declutter 365 participant, Nancy, who explained that this was "just a portion of the blue glass I decluttered in a downsizing sale this weekend." I hope the instructions for this mission have inspired you to declutter excess collections and collectibles from your house.